On Monday Talia gave herself a haircut. It's never good when a 4 year old gives herself a haircut. But please understand that my 4 year old has hair so long we have to hold it out of the way when she goes potty. We had been preparing her for the fact that we would be getting her hair cut soon, and explaining that cutting your hair a little bit helps it to stay healthy. She claims she did it to make it healthy. She claims that her inspiration came from Mulan. She claims. I don't buy it. I was very careful to explain the details. I was very careful to explain, after watching Mulan, that we should never do what Mulan did. I was very careful to explain that only a person who works at a "hair cutting place" should cut our hair, etc, etc. Admittedly, it could have been worse. This is something that can be salvaged. Thank goodness she didn't get closer to the root than she did. Thank goodness she didn't chop off the bangs we had been growing out. Oh, Talia, this is one to remember. 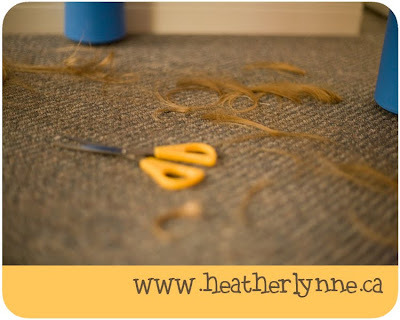 Check out tomorrow's post: Angel Hair for Kids, to hear the rest of the story! And thankfully that in the realm of WWMD (What Would Mulan Do) cutting her hair was her testing ground and not taking up Sun Tzu's Art of War. Oh my gosh, the look on her face is just too cute! hahaha i was like 16 before i figured out cutting your hair yourself is not a good idea lol. good thing she learned early! 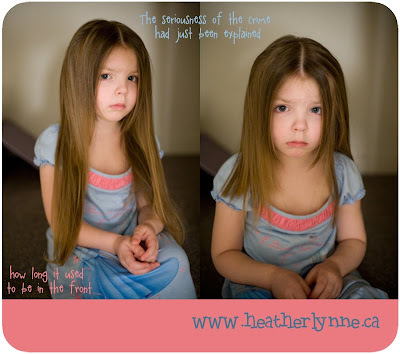 Poor little girl... she just looks so sad, but you are right she needed to know it was not the right thing to do. First-Yikes on the haircut. I've been there. Mulan is to blame for all little girls thinking they can cut their hair. Second-Beautiful pics. I am envious of good photographers. I am soooo amateur. Third- Thanks you for all your wonderful comments on my blog. It made my day. I love having new friends. I Love Mormon Mommy Blogs. It is a good way to connect with the like minded! At least she didn't go shorter. It really doesn't look that bad. I HATED my bangs as a kid...and one day just cut them off. Needless to say I had a very funny hairdo for a while, and it took AGES to grow the bangs out. Then, horror of horrors when we went to get my hair cut after they'd been grown out the stylest pulled out my hair and reached to cut a line arcross my forehead...luckily my mom stopped her just in time. Oh, Gale, once I trimmed my bangs (it was in grade 8!) because I was tired of waiting for my mom to do it- they were too short, and I had to go to "Grade 8 Grad" with way-too-short bangs (oops).